Looking eastwards along the water-filled ditch, the rhyne (rhymes with seen), that runs along the northern side of Totney Drove, the single track road that can just be glimpsed to the right of the tree’s trunk. The rhyne’s surface is mostly covered in water weed. A very peaceful scene, yes, but there’s danger here too. 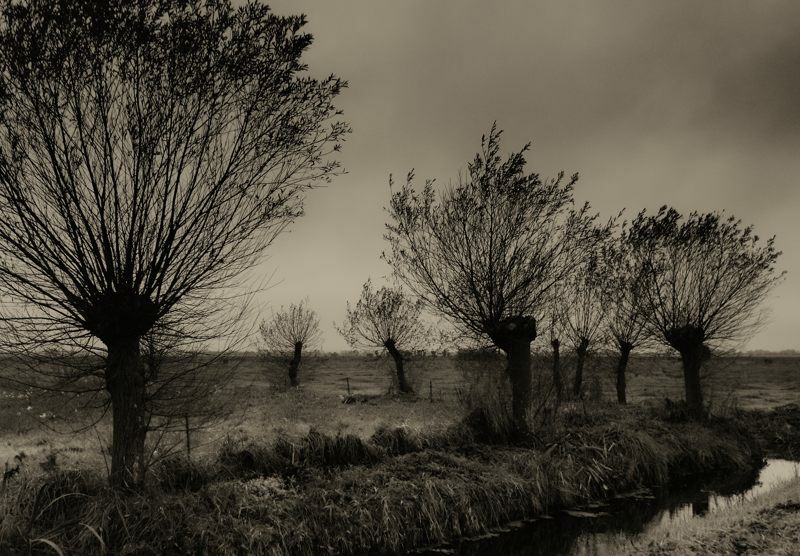 First, the tree (a Willow) is leaning slightly to the left, and the more this tilt increases, the more difficulty the tree’s roots will have in preventing its huge bulk from toppling right over. The soils here are damp and loose, and should they become waterlogged or actually submerged, as may happen in the approaching winter months, then the roots’ grip will loosen and the giant will fall. Second, a somewhat spindly wire fence at the rhyne’s edge aims to keep the cattle away from the rhyne: a cow falling into the deep water and ooze would certainly require a tractor to get it out again. In the background to the left, cattle seen as ghostly shapes in the mist, with woodland further back. And in the background to the right, there are several trees which are thick and heavy near the ground, but thinner further up. These trees have been pollarded, they are pollards, which means that, one or more times in their lives, they have had the wood from their upper parts removed, for firewood, woodwork etc, while their lower parts are left unaffected. Pollarding is an ancient practice, and more about it can be found here . There are other images from this early morning shoot here: 1 2 3 4 . Click onto the image to open another version in a separate window, and click onto that image to enlarge it – recommended. Technique: X-T2 with 55-200 Fujinon lens at 101mm; 200 ISO; Lightroom, using the Velvia/Vivid film simulation; Silver Efex Pro 2, starting at the Dramatic preset and adding a light Coffee tone; Totney Drove, Tadham Moor, on the Somerset Levels; 19 Oct 2018. This photo is best viewed enlarged – click onto it to open a larger version in a separate window, and click onto that image to enlarge it still further. Misty morning, Tadham Moor, on the Somerset Levels; 8 Apr 2015. What can we see? A line of fence posts angle into the foreground, with their reflections in a water-filled ditch. And on a horizon which the fog has brought far nearer than usual, a line of bare, pollarded willows (more about pollarding, and the Levels, can be found here). To the left of the willows is a solid, squat structure that resembles a pillbox, one the concrete strong points left over from World War II that still stand mute guard over these flatlands. But in fact this structure houses a pump that helps control the water levels in the myriad wet ditches – like the one in the foreground – that drain this often sodden ground. 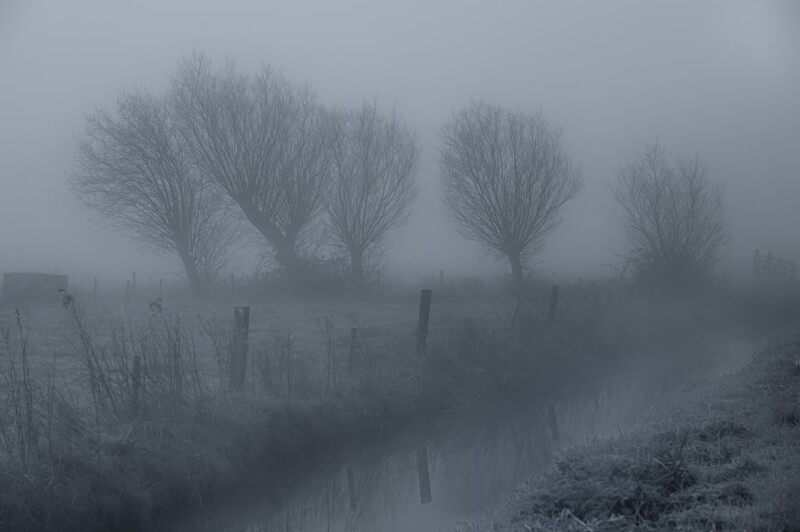 And finally, to the right of the willows, the shifting mist grudgingly reveals short fences that mark the point where a small bridge crosses the water-filled ditch, so that the farmer can move his animals to and from his land. 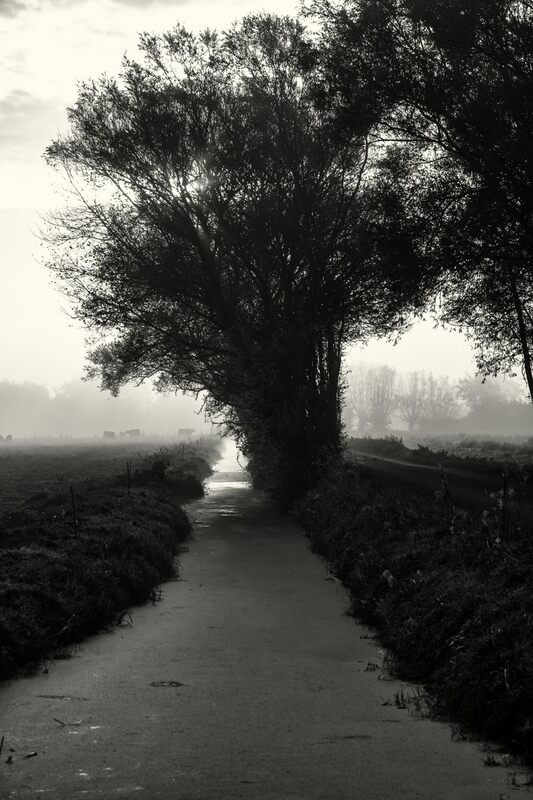 Quintessential Somerset Levels – wet ditches, pollarded trees – and mist. Technique: D700 with 70-300 Nikkor lens at 116mm; +0.7EV; 400 ISO; Silver Efex Pro 2, starting at the Antique Portrait preset and adding a blue tone. The rising sun lights a willow along Hurn Drove, on Ash Moor, to the northwest of Polsham, on the Somerset Levels; 28 Oct 2014. Early morning, driving slowly in shelter and shadow, travelling through a world of grey. But as I turned out onto Hurn Drove, the upper reaches of Our Star broke the horizon and shades of gold were all around. Click onto the photo to view a larger version in a separate window, and click onto that image to enlarge it still further. Technique: D700 with 70-300 Nikkor lens at 300mm; 6400 ISO; Silver Efex Pro 2, starting at the Low Key 1 preset and selectively restoring colour. Pollarded willows on Tealham Moor, on the Somerset Levels; 30 Oct 2014. A typical Levels landscape – dead flat countryside, with water (sometimes a lot of water!) and pollarded trees. Pollarding is explained here. The more I look at this, the more these trees resemble knobbly headed beings with huge coiffures, that are coming slowly forwards to look at me – the second and third from the left, in particular, seem to be craning to get a better view. Technique: D700 with 12-24 Sigma lens at 24mm; 800 ISO; Silver Efex Pro 2; Color Efex Pro 4. FATman with a fisheye lens on Tadham Moor; the Somerset Levels, 11 Dec 2013. The tall, dark but not handsome shadow lower left is me, taking this photo with a full-frame fisheye lens, which has a 180 degree field of view across the diagonal. I’m tilting this wild lens slightly downwards, and so the horizon is slightly bowed upwards. I’m standing at a small crossroads that I know very well and love very much. To the left, out of view, is the Magic Carpark. Straight on is Totney Drove, which rolls on westwards towards Rattling Bow and Westham. And to the right is Jack’s Drove, which I often mention and photograph, making off northwards towards Tealham Moor. Jack’s Drove is flanked by one of the water-filled ditches, the rhynes (rhymes with “scenes”), that are the field boundaries in this very damp area, and pale lengths of corrugated iron have been built into the rhyne’s bank to (try to!) prevent the road from collapsing into the waterway. Up from my shadow is a large, dark Willow (the largest tree in the frame), and in front of this is a pale Willow stump – which is the subject this other post. D700 with Sigma 15mm fisheye; 200 ISO; starting at Silver Efex Pro 2’s Triste2 preset. 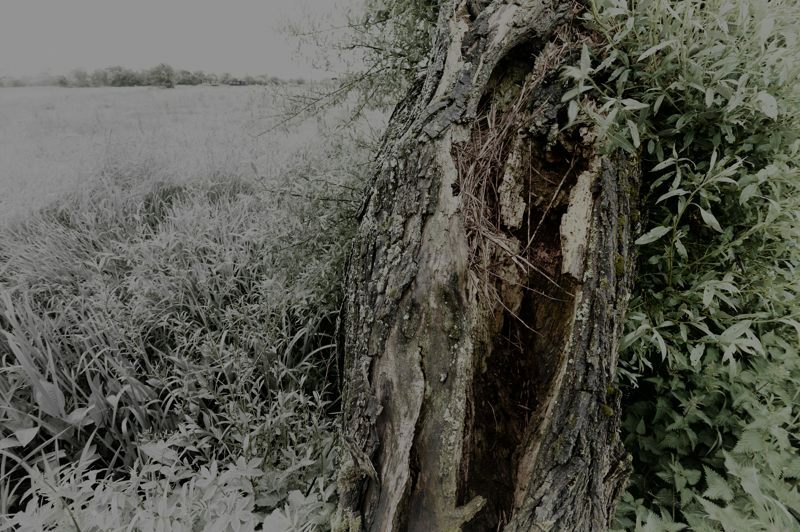 An ancient, pollarded willow by the side of Godney Road, west of Batch Farm, on the Somerset Levels; 29 May 2014. Often when selectively restoring colour to a black and white image, I heave the slider all the way over and am in danger of producing what that glorious song terms a “technicolor yawn”. But here the colours are muted. The ancient tree is not too far off what it should be colourwise, but the leaves to the right are pale and with low colour saturation. To the left of the tree there is almost no colour at all. And thanks to the wideangle lens, the view stretches off across a grassy field to some other low trees, which are no more than faint impressions on the horizon. This is a Minimalist image, perhaps – not in terms of actual content as it contains masses of intricate detail – but, rather, in terms of its portrayal of colour. What do you think? Another image in this series, along with information on pollarding, is here. D700 with 16-35 Nikkor lens at 16mm; 800 ISO; Silver Efex Pro 2, starting at the Triste 1 preset and restoring colour. Early morning, and a fallen willow lies beside the misty River Sheppey in Upper Godney; 1 Apr 2016. Another take on this scene, and more context, can be found here. Click onto this image to see a larger version in a separate window – recommended. D800 with 70-300 Nikkor at 300mm; 6400 ISO; Silver Efex Pro 2, starting at the Triste 2 preset. This image is best viewed enlarged – click onto it to open a larger version in a separate window. Fallen willow, a casualty of the recent storms, on the banks of the River Sheppey at Upper Godney; 1 Apr 2016. 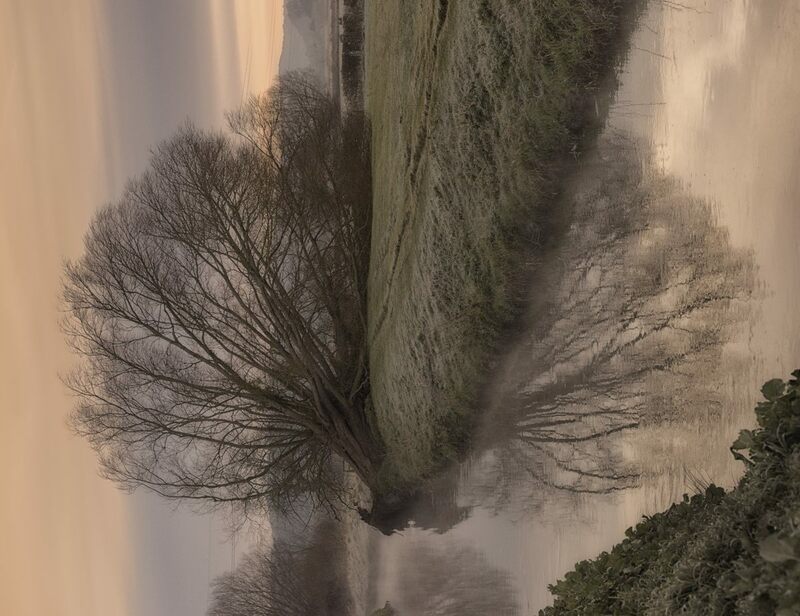 A cold early morning, the frost still on the grass on the other side of this little river, but only a breath of breeze to make more penetrative the already incisive chill. And an old tree, one I’ve known well, out for the count as they say. Well, everything changes, nothing ever stays the same, and we must make the best we can of that “Fact of Life”. The conventional thing would of course be to have had this image “the right way up”, in portrait orientation, and I have tried that. But, although this is a picture of (more or less) reality, and a sad reality at that, I prefer it like this, to me it has more feel and impact to it in this orientation – and after all, if I’m going to show a sad event, let’s get something else out of it too – death can have its beauty too. How do I see this image in my mind’s eye? 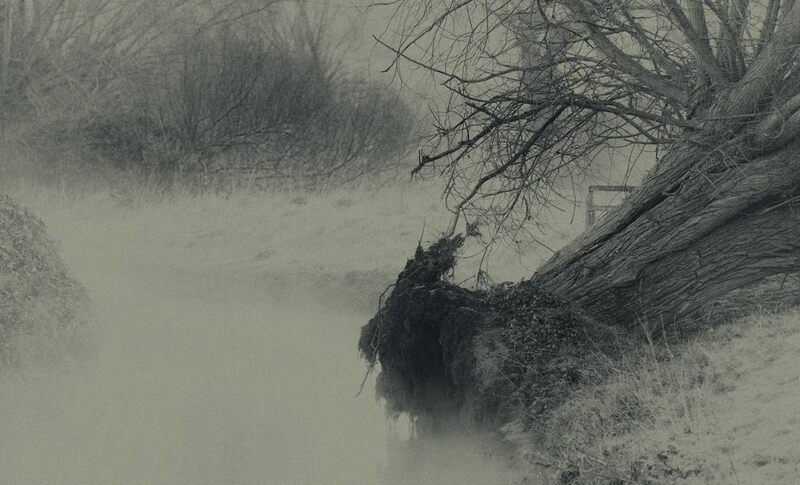 Well, if I let my mind go loose, that great, frosty wedge of grass on the opposite bank of the river looks like a sharp fang that is biting down deep into the picture’s heart; it is counterbalanced to some extent by the triangle of dark greenery at bottom right. And, in this orientation, the tree is really not in too bad a position to be admired, not so flat out and fallen as it is in cold reality. And finally, that great green fang biting down from the top of the picture has realities on either side, one real, one reflected – there are two cloudy skies and two trees down, and between them that great fang seems to me far nearer and more solid than either – its seems almost to be lifting up out of the image, almost as if it is biting down in front of the image. D800 with 70-300 Nikkor at 70mm; 3200 ISO; Color Efex Pro 4; 90 degrees’ anticlockwise rotation. Willow beside the Magic Carpark, Tadham Moor; 1 Apr 2016. 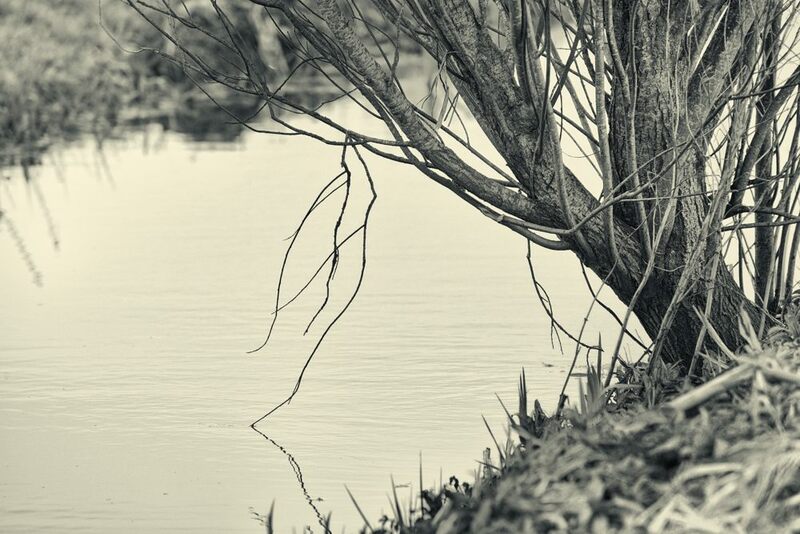 A little tree beside a water-filled ditch, in a place I often frequent. It was most probably planted here to help stabilise the waterway’s soft bank but now, as it gets bigger and heavier, its roots have more and more of a struggle to keep it upright in the soft, black, peaty and ever moist soil. Its like trying to firmly anchor yourself in wet blancmange and, sooner or later, gravity will – catastrophically – take over. D800 with 70-300 Nikkor at 300mm; 800 ISO; Silver Efex Pro 2, starting at the Fine Art High Key preset and adding a tone. This image is best viewed enlarged: click onto it to open a larger version in a separate window. The view eastwards on Butleigh Moor, south of the Polden Hills; 13 Jan 2016. 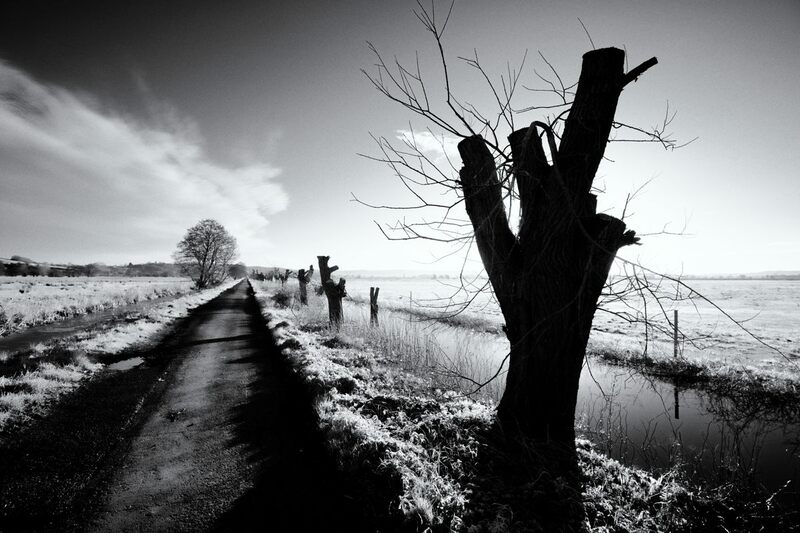 A bright and freezing morning out on the Somerset Levels given the piercing clarity of a strong infrared image. 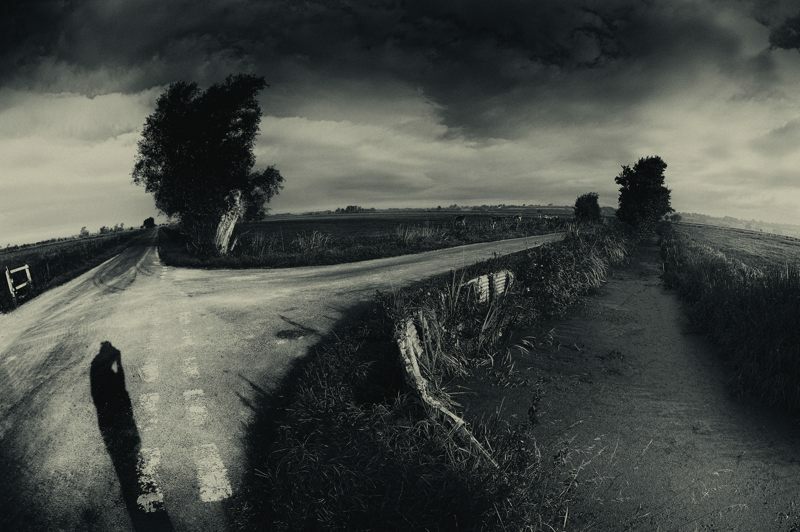 A thin tarmac road arrows into the distance, guarded on its southern side by a line of pollarded willow trees. 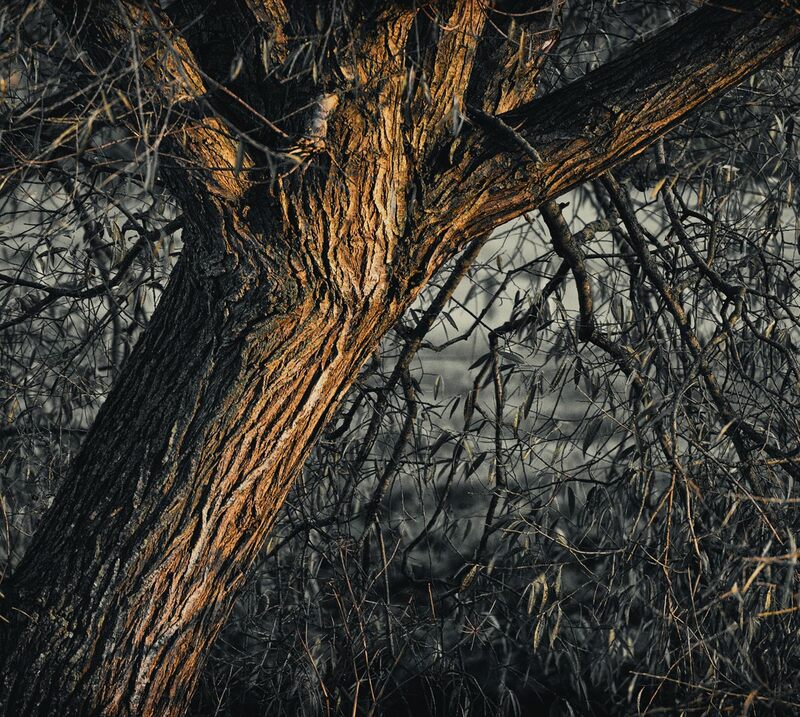 Placing the sun behind the nearest willow prevents its dazzling brightness from obscuring the rest of the image. More on pollarding, and the Levels, can be found here. The other version of (more or less) this view, with more context, can be found here. D800 with 16-35 Nikkor at 16mm; 200 ISO; Silver Efex Pro 2, starting at the Strong Infrared High Contrast preset.